Priestley & Freudenberg were Co-Owners of the Rubicon Race Team that originally surfaced at Indy during the Month of May as entrants of Massimiliano (“MAD MAX”) Papis’s single car entry prepared by Sam Schmidt Motorsports, although unfortunately Papis didn’t make the show that year, having crashed during the morning of Day 3 activities. Next Rubicon Racing joined forces with Pacific Coast Motorsports… (Remember them?) 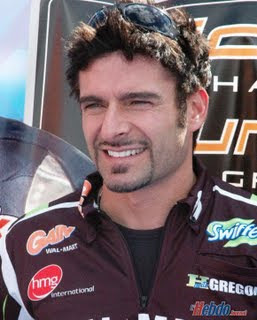 Before rebranding as Rubicon Sports Agency and joining forces with Eric Bachelart’s Conquest Racing in 2009, running Alex Tagliani up to the completion of the Edmonton event, before both Tagliani and Rubicon left conquest in order to form their new entity. The Team’s major financial backer is Montreal entrepreneur Andre Azzi, serving as the CEO, while FAZZT’s Chief Operating Officer (COO) is Jim Freudenberg; ex-Co-Owner of Kelly Racing, with Rob Edwards of Walker Racing being hired as the Team’s General Manager. Prior to Christmas, ‘TAG (Alex Tagliani), the 2009 Indy 500 rookie of the Year, having finished 11th Overall dropped by FAZZT’s new 25,000sq ft Indiana shop to see how it was all coming together; as the Team had previously purchased the assets of Marty “Geritol” Roth’s defunct IRL squad, including its four dated racecars. But I’m not sure whose shop they moved into since I believe that Andy O’Gara mentioned that Sarah Fisher Racing moved into the ex-Roth Racing Shops recently while preparing for their two car assault in 2010.